Transcendency is a state of being untainted by everyday limitations imposed by the conscious mind and our fast-paced environment. This voyage out of our ‘experience’ imbues us with a level of serenity unattainable in our daily lives. How many of us have entered this state of bliss during a dive, where everything we know disappears and we feel in perfect harmony with the liquid world around us and perhaps even the whole universe as we understand it? I rang in the new millennium at a depth of 30 feet (9m) off the dock at Les Escoumins, Québec. On this one very rare occasion, I wasn’t on a photo hunt nor did I have any plans other than to be in the water at midnight. Along with a few friends, we waited for the arrival of the year 2000 simply doing what we most loved. Once the moment had passed, we just hung off the wharf for a few minutes shaking hands and then started to head back to shore. That’s when it hit me, literally. I felt suddenly and acutely present. Through the noise of bubbles, a distinct sound emerged, unlike any I had heard at this site before. I slowed my breathing and tuned into it, oblivious to the dying festivities still unfolding behind me. Soon I recognised the chirps and squeals as the singing of beluga whales. The sounds became very clear and seemingly from all around. Drifting in the slight current I felt a pull from my reality and time into another, into that of the ocean. For a fleeting moment, I felt a part of the sea, no more and no less than the white whales whose song enveloped me in the darkness. I sensed a connection and I felt safe. It was comforting and instinctive, as though I had experienced it before, 33 years before to be exact. When I ‘awoke’ from this intense and dreamlike state of awareness, the idea of a new millennium suddenly seemed silly and artificial, an absurd human concept. Cousteau’s ‘silent world’ is primal and as it turns out, ideal for divers interested in the idea of communion with the living world. It’s been said that diving into the sea is like a return to the womb, with its enveloping, tactile nature. This vital source of life, by virtue of its immense size and absolute reign over our planet, is a place of reverence that invites us to connect with our inner-selves, far from the ‘noise’ of accumulated life experience, by reaching into the abyss of the soul. Maslow clearly identifies the sea as an ideal location to sense a peak experience, something many divers have understood for a long time, maybe since their very first immersion. Maslow also believes that these experiences are within reach of every person, and that many have already experienced such an event without realising it on a conscious level, since they are practically impossible to relive or describe with words. I occasionally meet other divers who have also sensed a connection with the sea and although none of us can effectively articulate our experiences, we feel rather than understand what the other is saying. Maslow explored the characteristics of the peak experience and its effects on the human mind; they are moments of pure ecstasy, where everything seems interrelated, in harmony, and of a serenity that is completely reassuring. These experiences are instinctive and can be shared between living creatures. Returning to reality, to the rational world, from such experiences can be jarring. A dive buddy tugging on your fin is all it takes to be yanked from a europhic state. Diving with dolphins in the open sea was everything I had imagined, and more. The setting was ideal: nothing but blue water on a flat and apparently endless sandy bottom. The ocean had never appeared so vast and the dolphins, repeatedly, would swim by us within arm’s reach. With every pass we looked deeply into each other’s eyes and I sensed a mutual effort to connect on a higher level. Although the professional and conflicting urge to take photos prevented me from completely letting go of my reality, this sense of connecting beyond mere visual contact seemed very real. Sensing a peak experience requires particular environmental conditions, physical awareness, and a very open mind. And yet it really isn’t as complicated as it appears. Nor is it dangerous. 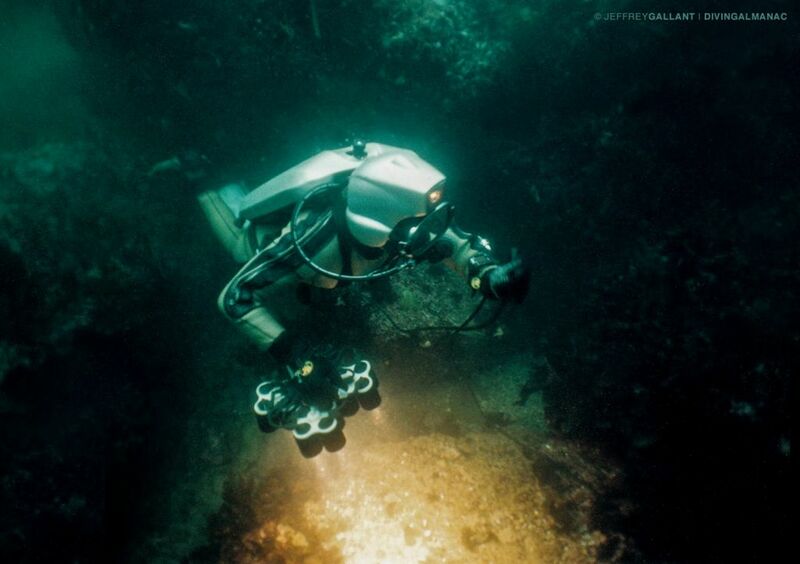 This is nothing like nitrogen narcosis and you will immediately be aware of any safety hazards such as loss of buoyancy control the moment they appear. I have often planned or even improvised attempts at peak experiences and have enjoyed considerable success without ever putting my safety at risk. Much like a shark uses its lateral line to detect vibrations, so can we use our bodies to detect the pulse of the sea. Being approximately 60 per cent water, the adult body is an ideal receptacle and transmitter of sounds and pulsations when immersed. Water is 800 times denser than air, making the body more attuned to sensing distant and profound vibrations and frequencies during a dive. And like all life in the sea, we receive and send out signals that announce our presence; however faint, these signals are sensed around the ocean world. My long search for the Greenland shark not only led me to the discovery of an elusive and relatively unknown Arctic predator, but also to more than one peak experience with an animal not known for its superior intelligence and, frankly, with a low charm factor. Unlike the dolphin, the shark has not endeared itself to humans. Still, on occasion I have experienced feelings looking into the eyes of these very large and emotionless fish, not unlike those experienced swimming with dolphins. In fact, I have repeatedly sensed a connection with all marine animals regardless of form or size; whether animated seals, schooling fish or even the stationary anemone, encounters with the sea’s living creatures always leave me with a profound sense of my existence, individuality, and of being part of a whole. Life came from the sea, humankind’s ancestors included, and thus we are inextricably linked with this most dominant feature of planet ‘earth’ and its inhabitants. Although terrestrial beings we spend our first nine months growing and developing in a liquid environment. To me, all this means is that the sea is a natural choice for those who seek to make a deeper spiritual connection within themselves. Experiencing the sea passively, in a sense ‘surrendering’ to it momentarily, can be rewarding. 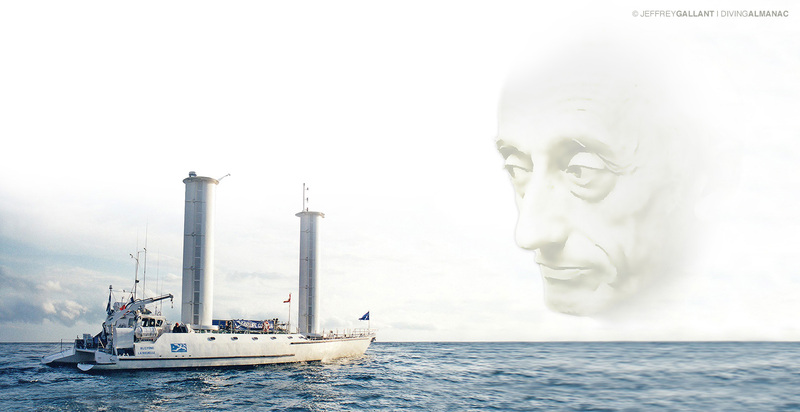 In World without Sun (1964), Jacques Cousteau states that “undersea exploration is not an end in itself, although it is spiritually rewarding merely to be an onlooker.” Hence to associate diving with spirituality is not a new concept. Surprisingly though, at a time when we are, perhaps, more receptive than ever before to our spiritual nature (not to be confused with religion), you won’t find any trace of the subject in most scuba training manuals. 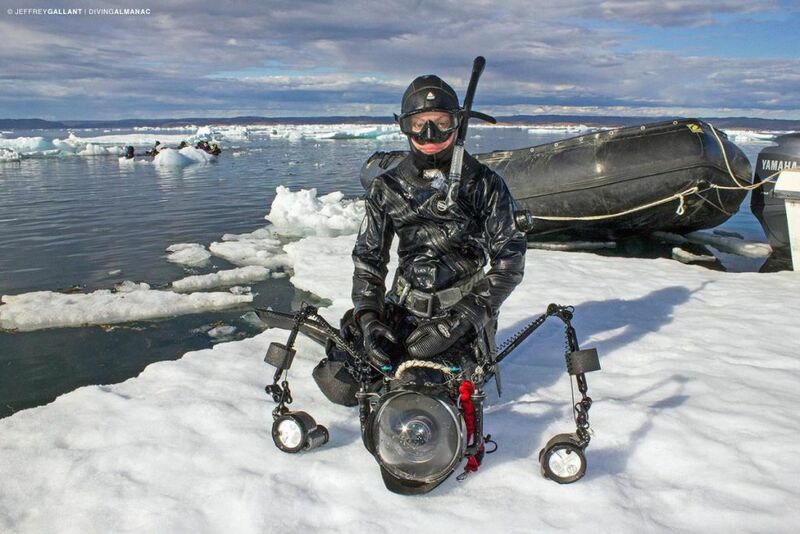 In Canada, the fact is our often bulky coldwater diving gear inhibits peak experiences. The cherished dry suit is surely the most troublesome piece of equipment for its ability to absorb the sea’s vibrations, insulating us from the experience we seek. Yet upon snorkeling fully-clad in the pack ice near Iqaluit, my Inuk dive companion was still able to contemplate and ‘feel’ the universe from the perspective of a seal on her very first outing. Even so, the less equipment worn, the better the chances are of aligning the necessary conditions to sense a peak experience. Having your skin in direct contact with the water, even in a wetsuit, is much more conducive to feeling the ocean. The noise of bubbles from open-circuit scuba also causes interference. Rebreathers produce none or far less making it easier to listen. Practically devoid of all this — interfering — gear, the freediver is better equipped to sense a peak experience. In fact, this is what keeps a lot of them coming back and going ever deeper. “To be able to swim like a fish and breath-hold like an orca is a feeling of being at one with the ocean that you get no other way that I know of,” says Phil Nuytten, one of the earliest freedivers on the west coast of Canada. Direct bodily contact with water also helps to hear sea creatures, which is a definite mood setter. When trying to home in on the chirping of beluga whales in the St. Lawrence, never mind the cold, flood your hood and let the ocean make its way to your eardrums. Then adjust your buoyancy to neutral, slow and synchronise your breathing with your partner and you will hear whales, as well as countless other mysterious voices speaking to you. Privacy is a rare commodity under water. In order to condition your mind for a peak experience, you must be aware of your place in this world. No matter how well equipped and trained we are, the sea is not our realm. As Hans Hass put it, “when we are surrounded by the fish and the waving tendrils of sea plants, we may regain a little of our lost humility.” Human arrogance will shut out the pulse of the sea more effectively than the thickest drysuit. Leave your ego on shore or the boat deck along with your scientific, technical or other training, before entering the water. Think of yourself as a helpless and insignificant piece of plankton drifting at the mercy of the tide, itself under the influence of cosmic powers. Open your mind to the biggest picture imaginable. Timing a peak experience is crucial. Dawn and dusk are stressful times on and under water. They are transition periods when animals are either scurrying to seek shelter or are still too nervous to come out of their hiding places. There’s too much excitement and little peace. Stormy or intense surge conditions will frustrate efforts to enjoy a peak experience. Waves breaking on the shore and the constant churning of bottom sediment resonate and echo in all directions thus creating a cacophony that drowns out even the ocean’s deepest vibrations. Diving near busy sea lanes also makes it difficult, if not impossible, to sense a peak experience. The propellers of seagoing vessels can be heard dozens of kilometres away even if the vessel is far out of sight. The steady rhythmic thumping of a propeller is completely unnatural and trains the brain to tune into the beat rather than be attentive to the unexpected. Unlike mechanical or musical sounds produced by humans, sounds coming from the sea are not subjected to the rhythm of a metronome. Ocean sounds fluctuate greatly and are as unpredictable as the Northern Lights. Although diving is one of the best ways to sense a peak experience, it is still possible, although a little more difficult, to connect with the ocean when the sea is too rough to dive or if you aren’t a diver. One of my favourite techniques requires a very large and smooth rock that protrudes above the waterline. The immense rock formations that make the shoreline at Peggy’s Cove, Nova Scotia, or at Cap-Bon-Désir, Québec, are ideal. Such large rocks are very good at amplifying sounds or vibrations coming from the ocean. If conditions are right, you may even hear the sound of whales emanating from the rock. Find a quiet spot where you can sit and place your bare hands with open palms facing downwards directly onto the rock face. Keep your eyes open or slightly closed and look to the open sea while keeping anything human out of sight. If you are able to free your mind, the rock will eventually feel as though it is an extension of the sea, and you will sense its power. Maslow’s theory of the peak experience helped me understand a little more the character of Jacques Mayol, the aloof protagonist of the cult movie The Big Blue, who ultimately fins into oblivion to forever be in this universe without words. For the most passionate of us, the attraction of the sea is exactly of this nature. While diving, we are complete. EDITOR’S NOTE: The animated version of this story is only available on desktop or laptop computers. To read the animated version, click on the arrow that is on the right side of the title banner image (the screen-wide image of the diver and planet with moving ‘bubbles’ below the main menu). The title banner image does not appear on tablets and smart phones. This text was originally published in 2000. The passage referring to the total absence of spirituality in scuba training manuals has thus been modified to reflect current practices (2018). Also, the reference to a dive off Iqaluit, Nunavut, is from 2016. I rang in the new millennium at a depth of 30 feet (9m) off the dock at Les Escoumins, Québec. Along with a few friends, we waited for the arrival of the year 2000 doing what we most love. Once the moment had passed, we just hung off the wharf for a few minutes shaking hands and then started to head back to shore. On this one very rare occasion, I wasn’t on a photo hunt nor did I have any plans other than to be in the water at midnight. That’s when it hit me, literally. I felt suddenly and acutely present. Turning away from the dock I faced the dark void, dive light off, attention focused on my place in time and space. Hanging suspended in the chilly ocean with all of my senses now investigating the featureless surroundings, I realised that I wasn’t alone. Through the noise of bubbles, a distinct sound emerged, unlike any I had heard at this site before. I slowed my breathing and tuned into it, oblivious to the dying festivities still unfolding behind me. Maslow clearly identifies the sea as an ideal location to sense a peak experience, something many divers have understood for a long time, maybe since their very first immersion. Maslow also believes that these experiences are within reach of every person, and that many have already experienced such an event without realising it on a conscious level, since they are practically impossible to relive or describe with words. 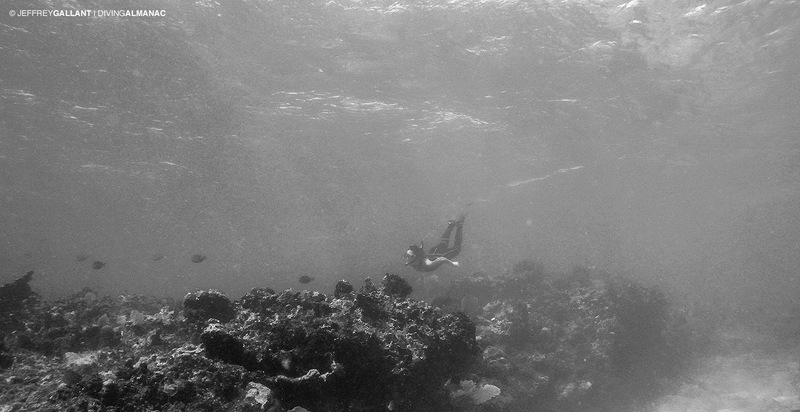 I occasionally meet other divers who have also sensed a connection with the sea and although none of us can effectively articulate our experiences, we feel rather than understand what the other is saying. Maslow explored the characteristics of the peak experience and its effects on the human mind; they are moments of pure ecstasy, where everything seems interrelated, in harmony, and of a serenity that is completely reassuring. These experiences are instinctive and can be shared between living creatures. Returning to reality, to the rational world, from such experiences can be jarring. A dive buddy tugging on your fin is all it takes to be yanked from a euphoric state. Diving with dolphins in the open sea off Roatan was everything I had imagined, and more. The setting was ideal: nothing but blue water on a flat and apparently endless sandy bottom. The ocean had never appeared so vast and the dolphins, repeatedly, would swim by us within arm’s reach. With every pass we looked deeply into each other’s eyes and I sensed a mutual effort to connect on a higher level. Although the professional and conflicting urge to take photos prevented me from completely letting go of my reality, this sense of connecting beyond mere visual contact seemed very real. My long search for the Greenland shark not only led me to the discovery of an elusive and relatively unknown Arctic predator, but also to more than one peak experience with an animal not known for its superior intelligence and, frankly, with a low charm factor. Unlike the dolphin, the shark has not endeared itself to humans. Still, on occasion I have experienced feelings looking into the eyes of these very large and emotionless fish, not unlike those experienced swimming with dolphins. In fact, I have repeatedly sensed a connection with all marine animals regardless of form or size; whether animated seals, schooling fish or even the stationary anemone, encounters with the sea’s living creatures always leave me with a profound sense of my existence, individuality, and of being part of a whole. Life came from the sea, humankind’s ancestors included, and thus we are inextricably linked with this most dominant feature of planet ‘earth’ and its inhabitants. Although terrestrial beings we spend our first nine months growing and developing in a liquid environment. To me, all this means is that the sea is a natural choice for those who seek to make a deeper spiritual connection within themselves. Experiencing the sea passively, in a sense ‘surrendering’ to it momentarily, can be rewarding. In World without Sun (1964), Jacques-Yves Cousteau states that “undersea exploration is not an end in itself, although it is spiritually rewarding merely to be an onlooker.” Hence to associate diving with spirituality is not a new concept. Surprisingly though, at a time when we are, perhaps, more receptive than ever before to our spiritual nature (not to be confused with religion), you won’t find any trace of the subject in most scuba training manuals. Practically devoid of all this (interfering) gear, the freediver is better equipped to sense a peak experience. In fact, this is what keeps a lot of them coming back and going ever deeper. “To be able to swim like a fish and breath-hold like an orca is a feeling of being at one with the ocean that you get no other way that I know of,” says Phil Nuytten¹, one of the earliest freedivers on the west coast of Canada. In order to condition your mind for a peak experience, you must be aware of your place in this world. No matter how well equipped and trained we are, the sea is not our realm. As Hans Hass put it, “when we are surrounded by the fish and the waving tendrils of sea plants, we may regain a little of our lost humility.” Human arrogance will shut out the pulse of the sea more effectively than the thickest drysuit. Leave your ego on shore or the boat deck along with your scientific, technical or other training, before entering the water. Think of yourself as a helpless and insignificant piece of plankton drifting at the mercy of the tide, itself under the influence of cosmic powers. Open your mind to the biggest picture imaginable. Timing a peak experience is crucial. Dawn and dusk are stressful times in the ocean. They are transition periods when animals are either scurrying to seek shelter or are still too nervous to come out of their day or nighttime hiding places. There’s too much excitement and little peace. Stormy or intense surge conditions will frustrate efforts to enjoy a peak experience. Waves breaking on the shore and the constant churning of bottom sediment resonate and echo in all directions thus creating a cacophony that drowns out even the ocean’s deepest vibrations. Diving near busy sea lanes also makes it difficult, if not impossible, to sense a peak experience. The propellers of seagoing vessels can be heard dozens of kilometres away even if the vessel is far out of sight. The steady rhythmic thumping of a propeller is completely unnatural and trains the brain to tune into the beat rather than be attentive to the unexpected. Unlike mechanical or musical sounds produced by humans, sounds coming from the sea are not subjected to the rhythm of a metronome. 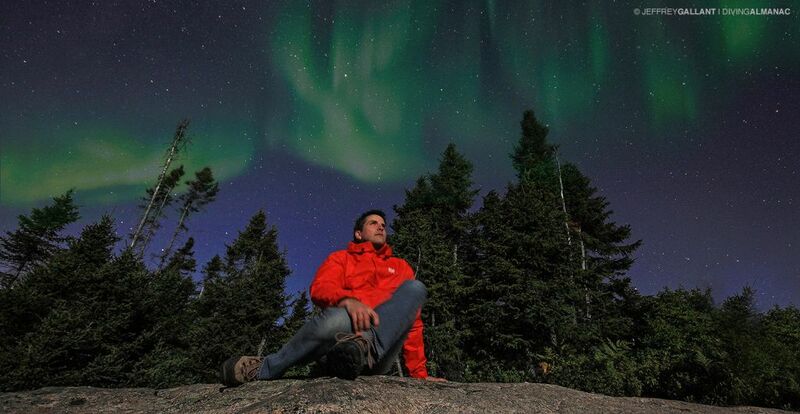 Ocean sounds fluctuate greatly and are as unpredictable as the Northern Lights. Dive Deeper… Scubapsyche offers specialty training in diving psychology, including how being underwater influences our experience and inner states such as emotions and thoughts; and how these inner experiences affect our behaviour as divers.